Plantation Movers – At Discount South Florida Movers we understanding how difficult moving can be. Our team of experts strives to provide you with the peace of mind that comes with using experienced professionals. With over fifteen years in the business, we provide exceptional service to the area. We guarantee that you will be satisfied with your move. No matter what your needs are, we can accommodate them. We handle moves that are down the street or all the way across the state. Scheduling your move for a night or weekend is also an option and we will do it at no additional charge. 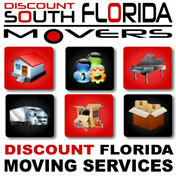 Come see Discount South Florida Movers for all of your residential and commercial moving needs. Plantation is a large city in Broward County home to 87,000 people. The city was used for shooting several very famous movies. The high school in There’s Something About Mary was actually the Plantation City Hall while the gold course from Caddyshack was filmed on the Rolling Hills Golf Course. The course has since been renamed the Grande Oaks. Despite extensive damage caused by Hurricane Wilma, Plantation also has a lot of development property. There are two malls in the city, the Westfield Broward mall and the Fashion Mall. Furthermore, DHL’s World Headquarters for the America’s is located there. There are also several for profit universities, American Inter Continental University and University of Phoenix. Discount South Florida and Plantation movers provide low rates on residential, commercial, piano and long distance moving.